Computer telephony integration (CTI) is a common name for any technology that allows for the integration and coordination of interactions on a telephone and a computer. 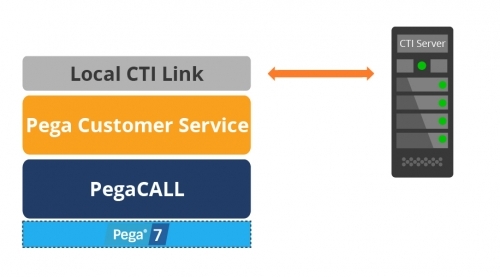 A local CTI link connects a Pega 7 server to a CTI Server directly, and provides CTI services to users on that Pega 7 server. Configuring CTI locally is also known as a collocated CTI deployment. A collocated CTI deployment is most appropriately used in situations where the network latency between the Pega 7 servers and the CTI platform is not significant. A remote CTI link connects a Pega 7 server (or cluster) to another Pega 7 server that accesses CTI services. Configuring CTI remotely is also known as a distributed CTI deployment. A distributed deployment is used in environments that are more complex, because it separates CTI and application-specific processing. For example, CTI capabilities could be located on servers close to the ACD/PBX, while application-specific processing could be located in centralized data centers.